When you think of porcelain, don't limit your vision to small- or medium-format tiles that range in size from 2”x4” to 12”x24.” Think instead of Stile® Porcelain slabs, which provide nearly 60 square feet of coverage per slab. Stile has the inherent beauty of natural stone without stone's sealing and maintenance requirements, which makes it an unsurpassed solution for a variety of residential design applications. Bathroom floors, countertops, accent walls, and shower and bathtub surrounds can be quickly updated with Stile® Porcelain slabs from MSI. Their 118”x59” and 126”x63” dimensions allow you to design and create eye-catching surfaces virtually free of grout lines or seams. 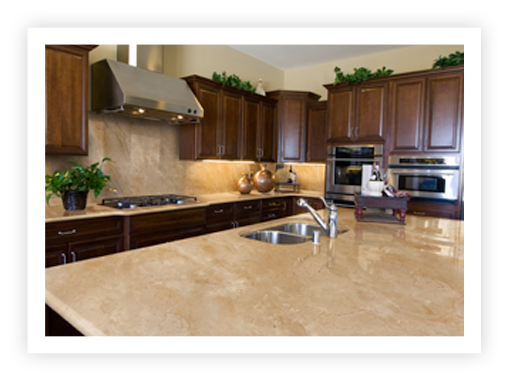 In kitchens, Stile® Porcelain slabs fashion good-looking countertops for cabinets and islands. Engineered to be as durable and as resistant to bacteria and germs as quartz, the porcelain slabs are also heat, scratch, and stain resistant. Picture a behind-the-range backsplash sans grout lines; these large format slabs fashion seamless backsplashes that let you cook, splash, and splatter without worrying about damaging your walls. Imagine durable, stylish, easy-to-clean flooring in your entryway. Stile® Porcelain Slabs capture the beauty of natural stone without the cost or maintenance. Stile® Porcelain Slabs are perfect for exterior projects, too. Use it as fascia on commercial and residential properties and to wrap columns, structural supports, patio bars, planters, and other structures. Porcelain slabs can also be used to create outdoor kitchen walls, create countertop and fireplace surrounds, and to weather-proof tabletops. The applications are nearly endless for Stile® Porcelain slabs from MSI. Browse through our colors and patterns, and see how you can transform your space with Stile® large-format porcelain slabs. Large format Stile® Porcelain slabs are ideal to create a seamless natural stone look, at a fraction of the price of natural stone slabs.